Take a tub of warm soapy water100 ml seed oil, a handful of marbles500 ml full fat milk, A handful of rose petals. A handful of fresh margosa/neem leaves5 drops geranium oil5 drops sandalwood oil2 tsp wheat germ oil. Now mix everything together and soak your feet in this water for about 20 minutes and pat dry. Use a pumice stone to dislodge dead skin on the heels. Oil you feet at night with a mixture of the following ingredients: 2 tsp castor oil, 2 tsp olive oil and 2 tsp almond oil. 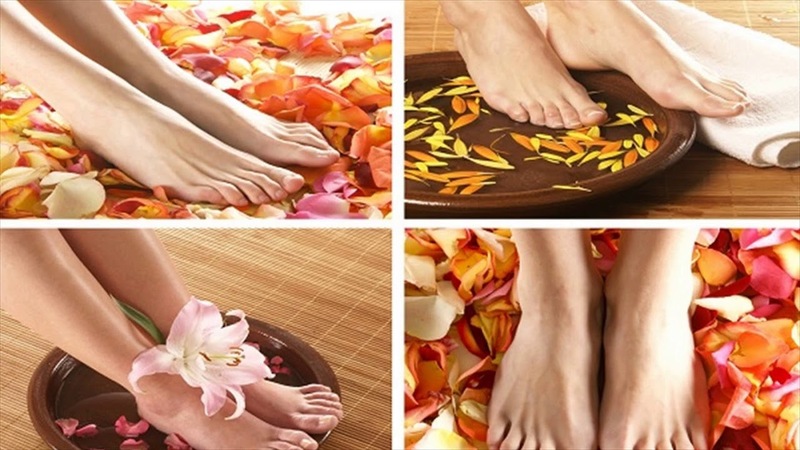 Now massage these oils on your feet (this should be done at night). Smear Vaseline into the cracks of your feet, see that it is absorbed into them very well. Melt a candle in a saucepan on a gentle flame. Use a flat brush and carefully apply to the skin. Let this cool and dry. Wear cotton socks and cover. Leave overnight. Next day in the morning peel off from the skin and rub any remaining residue into the skin. Daily 5 minute routine that you can do is to take lemon halves and 3 tsp of sugar. Dip the lemon halves into the sugar and scrub on the heels daily until all the granules have melted into the skin. Let it dry and wash off with water and pat dry.